NEW YORK (WABC) -- When next winter rolls around, the New York City Department of Sanitation will have some new tools to help clear the many streets and sidewalks of the five boroughs. 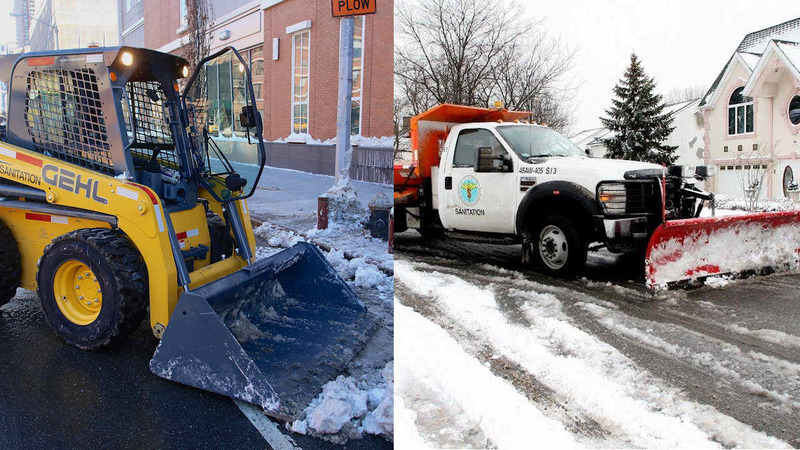 On Monday, Mayor Bill de Blasio announced that the Fiscal Year 2017 Executive Budget will include $21 million for the Department of Sanitation to help fund new snow removal equipment. This includes 80 new haulsters, which will allow the sanitation department to limit the number of outside contractors that are called upon during snow storms and help with snow clearing operations on the thousands of small and narrow streets around the city. The funds will also bring in 40 new skid steer plows that will help clear crosswalks and bus stops and add 21 additional front-end loaders. "Sometimes the little things can make a big difference - especially in a snowstorm. DSNY needs to be able to clear snow from narrow streets and crosswalks in the most effective and efficient way possible - and new haulsters and skid steer plows will help them do just that," said Mayor de Blasio. "This new funding will make our streets safer for pedestrians and vehicles by purchasing smaller equipment that will help DSNY deftly navigate snowy streets and clear crosswalks and bus stops." Last January's record challenging snowstorm left many Queens residents frustrated after long waits for streets to get plowed in certain areas, so Sanitation Commissioner Kathryn Garcia believes that this new equipment will help improve cleanup in future snowstorms. "DSNY faced enormous challenges during the January blizzard that went down in the record books as the second worst snowstorm ever to hit our city," said Commissioner Garcia. "One of those challenges was the intense snowfall that hit sections of Queens, burying smaller streets in some communities with up to 30 inches of heavy snow. As a follow up to the Mayor's desire to improve response time in the future, we identified the need for smaller, specialized equipment that could be housed in those neighborhoods. These new haulsters, crosswalk plows and front end loaders will help enormously."